Over the last 25 years, the design of High-speed Lines in Spain has undergone an important evolution, which has been enhanced by the multitude of High-speed kilometers that have been built throughout the National territory, and by the multitude of problems and constraints, of very different nature, which have been identified as challenges and have resolved in a favorable way. IDOM having participate in 2,300 kilometers around the world as a specialized firm in the design and supervision of works for construction of High-speed lines, has lived first hand this evolution, contributing through its different projects and studies, to the development of the current Spanish High-speed model. In addition, it has subsequently been able to export the Spanish model, as a more appropriate solution, to other European Union countries, such as Poland and Sweden. 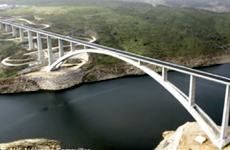 Throughout this presentation, a brief review of the variation of design over the last 25 years will be made, quoting different projects that were engineering milestones, such as: the Basic Design and Works Supervision of the stretch Lalín - Santiago with 47 km in length; as well as the Detail Design and Works Supervision of the sub-section of Alcántara-Garrovillas Reservoir, which includes the Almonte viaduct, with a 384 m central arch, which is the world's longest span for a High-speed arch bridge. On the other hand, a short review will be done later on the major international projects of great relevance, which have currently been or will be designed, having the Spanish High-speed model as one of its main reference bases. The main objective of this presentation is to show the particular vision of the Consultant Engineer on the historical evolution experienced by the Spanish High-speed rail network, and to highlight the great strengths presented by the Spanish concept of design.